Is that true? Is a Yangtze River Cruise still worth it? ...and it certainly would have been wonderful to see the Three Gorges before they started filling that dam. So we didn't get to cruise the Yangtze River until the dam was over three quarters full. 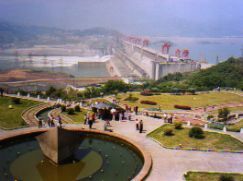 The Chinese declared the Three Gorges Dam completed right after we visited. Many towns and villages have been flooded and their citizens relocated. The ecologic, economic, and sociological consequences of all of this have been thoroughly debated. It makes little difference what we think about these issues. What I can tell you is that even with the dam mostly filled, a Yangtze River Cruise IS worth it. Is Planning A Yangtze River Cruise Still Worth It or Not? When we were planning our trip we didn't know yet what the answer to that question was. I was convinced that we should take a short 3 day/2 night cruise just in case. We wouldn't waste an extra day if we didn't like it. The downstream cruise moves faster, and since we like to stay really active, I thought that would be better. The travel agent who helped us set up our custom small group tour told us that he recommended the 4 day/3 night upstream version. We took his advice because the flights seemed to work out better for us. Because we were a small group we could fly into Yichang which deleted a 4 hour bus ride from Wuhan. We flew in directly from Xian after visiting its terracotta warriors. The Yichang airport is smaller and the planes serving it tend to be smaller too, so big groups might not be able to do this. All the more reason for trying independent small group tours like we love taking. The upriver cruise was less crowded. Our crew told us that this is generally the case. Our ship could hold 200 passengers. But... On our cruise there were only 60 passengers! On the downriver return, they were expecting 190. Don't think you'll be alone on the river. There will be many other boats. At some excursions, you'll have to troop through other boats to get ashore. 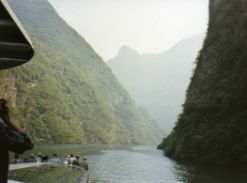 There may be small and then even smaller boats to catch for excursions up the lesser gorges, and buses to board. They'll have plenty of buses or boast, no matter how many are on your cruise, but a smaller number of passengers makes this seem like a more custom tour.... and that's what WE like!!! ...but not so much that we got bored. We had a great time exploring the Ghost City of Fengdu. It sits high above the river, but it has been abandoned. You can walk or take a gondola up and down. You get on small boats and explore river valleys that were previously unnavigable. So with the dam, we've lost some things and gained some. 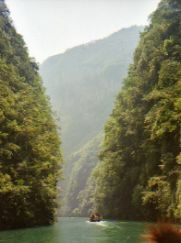 Getting up into those lesser gorges alone makes the Yangtze River Cruise still worth it. 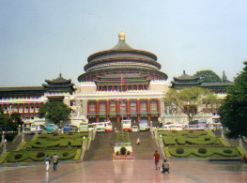 We started our China tour in Beijing and took the overnight train to Xian. We flew to Yichang straight from Xian. We love to experience it all, so trains, planes.... why not a cruise? The experience of different modes of transportation could make a Yangtze River Cruise still worth it. 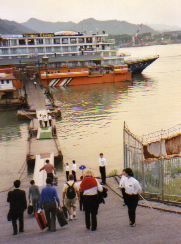 It was early evening when we arrived in Yichang, and we immediately boarded our boat, so we can't give advice on what to explore there. We ended our cruise in Chongqing and spent the day there due to the flight schedules. 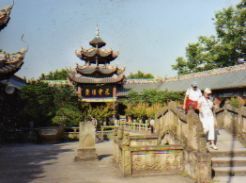 But... if we had it to do again, we'd try to get to the caves and grottos of Baoding Shan and Dazu with their Tang Dynasty carvings. It's two hours from Chongqing, and it would be a long drive for a day trip, but we'd try it because that's just the kind of adventure we love. And organizing your own small group custom tour is all about having the adventure that YOU love. Our late night flight from Chongqing took us to Guilin so we could explore the amazing karst landscape we had dreamed of seeing there. Our travel tip here is that even with the Three Gorges Dam finished and filled, a Yangtze River Cruise is worth considering when you're planning your visit to China... whether you join a pre-packaged group tour or organize your own small group custom tour. Yangtze River Cruise Still Worth It? TELL US WHAT YOU THINK: If you have been since the dam was full, we'd love to hear what you thought... you can use the comment box at the bottom of the page (whether you use Facebook or not!) Thanks, you'll help us all out.